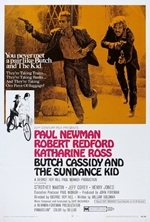 Butch Cassidy and the Sundance Kid is a 1969 American Western film directed by George Roy Hill and written by William Goldman (who won the Academy Award for Best Original Screenplay for the film). Based loosely on fact, the film tells the story of Wild West outlaws Robert LeRoy Parker, known to history as Butch Cassidy (Paul Newman), and his partner Harry Longabaugh, the "Sundance Kid" (Robert Redford), who are on the run from a US posse after several train robberies. The pair and Sundance's lover, Etta Place (Katharine Ross), flee to Bolivia in search of a more successful criminal career. In 2003, the film was selected for preservation in the United States National Film Registry by the Library of Congress as being "culturally, historically, or aesthetically significant." The American Film Institute ranked Butch Cassidy and the Sundance Kid as the 49th-greatest American film on its AFI's 100 Years...100 Movies (10th Anniversary Edition) list.